Part of our weekly CSA farm share produce has been delicious organic beets. Our recent produce box yielded two kinds of beets - Chiogga and Detroit Reds. I love beets and could eat them just about every day. They are mostly good for you -I say mostly because they are high in sugar and if you are watching your sugar intake, then eating them and my salad is not something you want to do every day. This is an old stand-by salad that I used to make weekly when I worked at the Reading Terminal Market for Andro's Fine Foods. We made some beautiful food at this place and I have many recipes from both Andro's and Jill's that are still in my rotation of cooking recipes. Here it is - easy and delicious and the perfect year-round salad. Wash and cook the beets. The beets will taste better if you roast them, but it takes longer and requires turning on the oven! 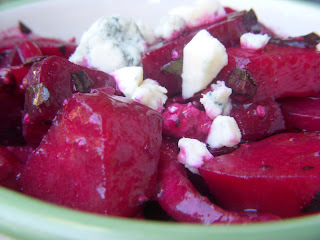 For this recipe, I boiled the beets until they were knife tender in a large pot of water - about 45 minutes. Cool the beets and after they are cool enough to handle, remove the skins. Cut the beets into 1/4-inch thick quarters. Add them to a large mixing bowl and set aside. Peel, seed and dice the Granny Smith apple. Add it to the cut beets. Don't worry about the apple turning brown, everything will become "beet red" from the beet juice. Add the julienned red onion and diced celery to the apple and beet mixture. Toss gently to combine. Make the dressing by whisking together the molasses, balsamic vinegar and mustard powder. Add a pinch of salt and a few grinds of black pepper. Continue to whisk and slowly drizzle in the olive oil until the dressing is emulsified. Taste and adjust seasonings with additional salt and pepper. The dressing should taste sweet and tangy, but not too sweet or oily. Add more balsamic if needed or a bit more oil. Pour the dressing over the apple, beet, celery and onion mixture and toss to combine. Before serving, add in the parsley, toasted walnuts and bleu cheese. Serves about 6-8 as a side salad. Serve cold or at room temperature.